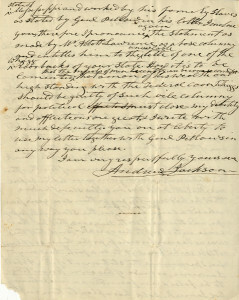 Autograph Letter Signed, two pages, quarto, Hermitage, November 30, 1844. To William Prescott, the American historian and conservative Whig, defending James K. Polk, the Democratic president-elect, against false accusations made by the Whigs concerning his slave holdings in Mississippi. At the Democratic national convention in 1844, Polk, a life-long supporter of Andrew Jackson, was selected over Martin Van Buren, on the ninth ballot because of Van Buren’s opposition to the annexation of Texas. The campaign of 1844 was one of many personal attacks. On one front, the Democrats denounced Whig candidate Henry Clay as a gambler and drunk, and as a shifty opportunist for the highest office in the land. On another, the Whigs branded Democratic candidate James K. Polk a puppet of Andrew Jackson and a coward for having once refused to take part in a duel. Polk had supported Jackson throughout his turbulent career with such consistency that he was nicknamed “Young Hickory.” In the election, which took place (in most states) on November 12th, Polk was victorious, winning the electoral votes of fifteen states. Abbott Lawrence (1792-1855), whose statements Andrew Jackson considered to be “a base calumny,” was a merchant and statesman who founded and developed Lawrence, Massachusetts. An ardent Whig, he represented his district in Congress from 1834 to 1836 and 1838 to 1840, and attended the national convention in 1844 as a delegate. In 1848 he was a leading candidate for the vice-presidential nomination. 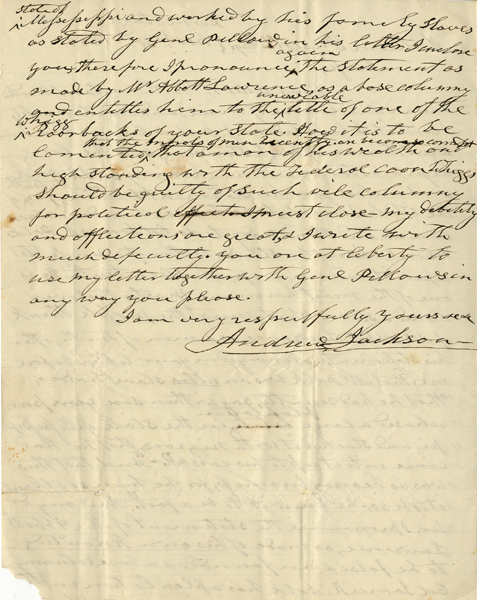 General Gideon John Pillow (1806-1878), to whom Jackson forwarded Prescott’s letter, was a criminal lawyer in Columbia, Tennesse, who had fought for the Confederacy during the Civil War and was Polk’s partner for some time. He claimed for himself the major responsibility for the nomination of Polk for the Presidency in 1844. The term “Roorbach, a political canard (especially one that backfires), arose in the campaign of 1844, when the Ithaca (New York) Chronicle printed some alleged extracts from an imaginary book entitled Roorback’s Tour Through the Western and Southern States containing grotesque charges against J. K. Polk, then Democratic candidate for the presidency, and they were promptly copied by other Whig newspapers” [H. L. Mencken, The American Language].